Not exactly what we expected in the SPX but with so much Y ratio about we are certainly not surprised. Although, perhaps a bit by the speed of it all, which now makes this expiry a week ahead of schedule. As we have said so many times before the perfect expiry is when an index moves towards the R ratios (either up or down), interacts and reverses course, then proceeds to interact with the corresponding one on the other side of the zone before finishing in said zone on the rollover. Of course, this trip we have hit R3 at the start, and now we have hit R1, the difference is that it has taken a week to do what should have taken two. On Monday the intraday high was 2800.18, which is a few points shy of R1 at 2805 admittedly, but considering this index in just two days was up 64-points then the Vega alone makes this a hit. But when you consider it had actually travelled 170-points from the intraday expiry low then 4-points is nothing. All this is made all the more normal because the zone still can’t decide where it wants to be, stopping either side from developing. Which means this huge Y ratio bandwidth has been virtually unchanged throughout this expiry, so as we said way way back in the rollover (14th Nov) what else would you expect to happen? Goodness only knows what they are trying to achieve in the NDX, perhaps they might have succeeded and this volatility is exactly what they want? On top of the changes last time, which we referred to “as a major systems overhaul” they have reverted to type and added another whole swathe of what we consider totally unnecessary strikes. The upshot is that the zone here has reverted to 7075-7125, but really it should have remained unchanged at 6775-6825. Had it done so, then all three would be back within their respective zones. We think that is exactly where they want to be, but it’s just the DJX that has achieved it, on the face of it at least. The SPX because it is so slow to change, the NDX because it’s not so much the goal posts but rather the playing field that’s shifted. Again, to repeat, this constant tinkering means the zone can’t settle, therefore the ratios can’t develop, and the end result is a colossal Y ratio bandwidth leading to markets that use them in their entirety. You may or may not enjoy this volatility, but hopefully at least you expected it and know the reasons behind it ably aided and abetted by the politicos fuelling the fire. 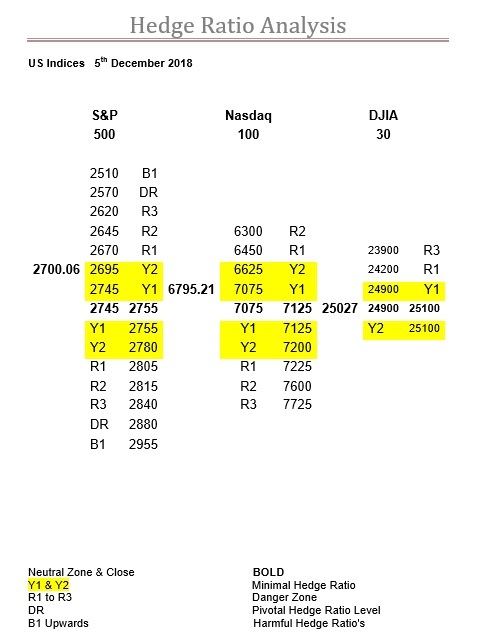 What else can you say about the DJX being back in its zone, apart from perhaps had, or if, the SPX’s zone moved to 2695-2705, as anticipated, then both these indices would now be in their respective zones. Basically, exactly the same as what we say above, there is so much Y ratio about what else would you expect? The big question is whether or not, now it is way ahead of schedule, it will pause for breath in its zone? The other aspect to consider is the change in the ratio at 23900, which jumps a level, but is witness to an increase in the ratios below the zone, which only strengthens R1 at 24200, and considering the expiry intraday low is 24268 this may be pertinent. Both FTSE and DAX hitting all their ratio levels, today’s Ratio Table, levels and comments.t.